Continuing with our series of posts on some of the most common mortgage “need-to-knows”, this post focuses on amortization periods. We will define what an amortization period is, how it affects you and answer the most common questions about it. How Does an Amortization Period Differ From a Mortgage Term? What Are My Options for Amortization Periods? How Does My Amortization Period Affect Me? Does My Amortization Period Depend on My Credit Score? How Do Amortization Periods Work in Private Lending? An amortization period is the length of time it could take you to pay down your mortgage, starting from the date of your mortgage agreement. The word “could” here is important. If your mortgage has a 25-year amortization period, then that means it would take you 25 years to pay off if you make the regularly scheduled payments. However, you don’t HAVE to take that long. You can make accelerated or lump-sum mortgage payments that would pay off your mortgage much sooner. A ‘term’ is the length of time for which your mortgage agreement is in effect. At the end of the term (typically 5 years) your agreement is renegotiated (new interest rates, options, etc.). So, your mortgage will have several terms over the course of its amortization period. You don’t have that many options for amortization periods. In 2006, it was possible to get a 40 year amortization period. Now, you are pretty well capped out at 25 years. It’s simple: the longer the amortization period is, the more you will pay in interest, but the less your monthly payments will be. Save a little now, pay a lot more later. More affordable, but also more costly. 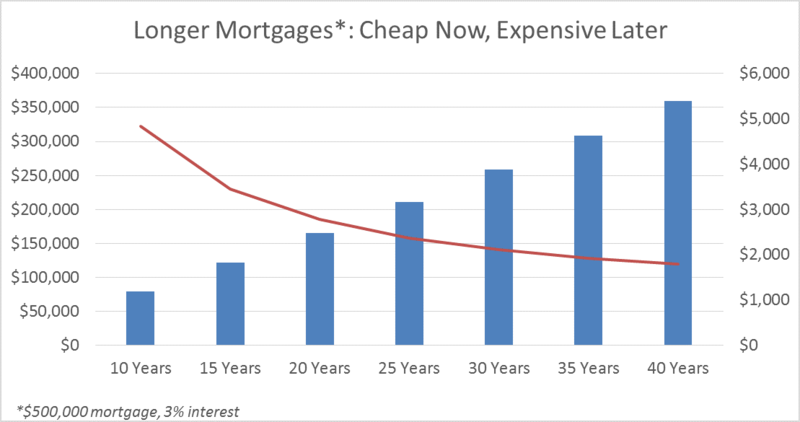 As an example, if you have a $500,000 mortgage, moving from a 25 year amortization period to 30 years will save you about $260/month on your first mortgage payment, but it will also cost you almost $50,000 over the life of your mortgage. Amortization periods don't generally apply to private lending. That's because private loans are typically interest-only. If principal payments are not mandated, then an amortization period can't be specified.